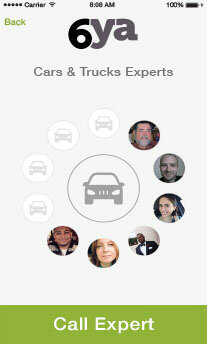 6ya instantly connects you with repair Experts by voice or video on your smartphone. Open the app and choose the category you need help with. 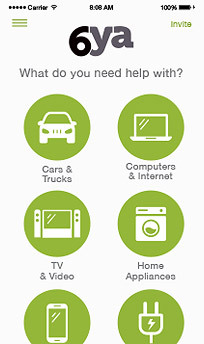 Categories include anything from cars and trucks, home appliances, tv, smartphones and computers as well as home improvement like electrical and plumbing. Our Experts are thoroughly vetted so you can be sure they will be knowledgeable in the category you’re calling about. No waiting on hold, no automated representatives, no scripted answers, just a real person giving you the answers you need. 6ya is a subscription based service for only $6 per month. Secure, cash-free payments are processed by Stripe who encrypts card numbers on separate machines to keep you safe because we take your security very seriously. Log into 6ya, click on drop down menu and go to “Membership” then click "Deactivate." How is 6ya different from all other tech support services? 6ya lets you to talk to a professional expert and share video from your smartphone in seconds. Will I be placed on hold? We never put you on hold, transfer you to multiple representatives, or let you speak to computers and call centers in foreign countries. Will you solve my problem? While the vast majority of issues could be fixed over the phone in a few minutes, some problems require replacements parts or professional repair. 6ya is offered through various Membership options that include Unlimited Help, and several pay-per-call options starting at $9 per call. All 6ya experts are real repair professionals from the US who like to help people over the phone and earn money for it.